Gravity’s strength is minuscule, yet it dominates the universe. Science writers have not ignored the subject, but the world-shaking 2015 discovery of gravitational waves is provoking a flurry of updates. New Scientist cosmology consultant Chown (What a Wonderful World: One Man's Attempt to Explain the Big Stuff, 2013, etc.) is early out of the gate, and readers searching for a lucid popular account would do well to start here. The author begins with Isaac Newton, who showed that gravity was a universal phenomenon whose actions could be calculated by anyone. However, he could not explain how it worked, and no one (Newton included) felt comfortable with one body influencing another magically across empty space. Einstein’s theory of relativity eliminated magic by explaining that any mass warps space-time in its vicinity. Following Newton’s laws, all bodies move in a straight line. They appear to bend when passing through warped space-time, but they are still following the straightest path. “Because that theory recognizes that gravity is nothing more than the curvature of space-time,” writes Chown, “the quest to understand gravity has been transformed into a quest to understand the origin of space and time.” Relativity theory predicts gravitational waves, but they are incredibly feeble. Einstein doubted humans could detect one, but success would reveal so much new knowledge that physicists could not resist trying. 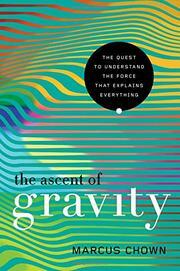 The author spends less time on the mechanics of gravity wave detection than the implications, concluding with discussions of string theory, quantum mechanics, black holes, dark matter, and the ongoing search for a deeper theory. This is de rigueur for popular books on cosmology, but Chown’s effort is more comprehensible than most. A fine report on the latest piece of the puzzle that may, sooner or later, enable physicists to explain everything.